Romans 1:16 Says: “For I am not ashamed of the gospel of Christ: for it is the power of God unto salvation to everyone that believeth; to the Jew first, and also to the Greek.” Such message seems to be the constituent elements that thread the life and ministry of Minister Terrance F. Matthews. Minister Terrance Frank Matthews was born and raised in Bridgeport, Connecticut. Matthews attended high school in Bridgeport, Connecticut. Following high school, he attended the Baptist Institution, Benedict College in Columbia, South Carolina receiving a Bachelor’s of Science degree in Computer Science in 2005. Pursing excellence, Minister Matthews earned a degree in Computer Networking in 2008 at the College of Westchester in New York and subsequently, a Masters in Forensic Computer Investigation from the University of New Haven (UNH) in West Haven, Connecticut in 2011. It was at UNH, Matthews learned that fellowship between like-minded Christians especially concerning young adults was imperative and vital. As Minister Matthews began to pray and study The Word of God incessantly, he accepted the called into ministry in 2006 and was ordained in April of 2008 under the direct leadership of the late Overseer Bishop Zebedee Stewart and Pastor, Bishop Reginald D. Stewart at The Pentecostal Church of Prayer and Deliverance, in Bridgeport, Connecticut. Overseer Stewart cultivated and nurtured his knowledge and wisdom of God by teaching him the principles of leadership and governance. In 2009, at the age of 25, Minister Matthews became the youngest Minister at Prayer and Deliverance to be appointed a clergy position, culminating in 2012 when he was promoted to the position of Elder. Minister Matthews was Chief Superintendent of Sunday School, in the role of educator and administrator; He served for over 10 years in such capacity; Matthews was a faithful member for 33 years. He was greatly involved in the youth department and other ministries in the church. Terrance loves teaching and walks the path of righteousness to show others the way of the Lord. Continuing his overwhelming thirst and desire to the Ministry of God, Minister Matthews sought a more theological and doctrinal approach to the word of God. 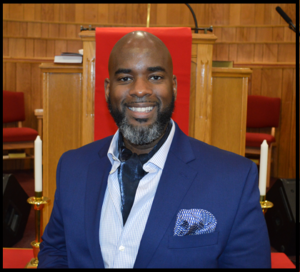 He attended and graduated with Honors as Valedictorian of The Higher Learning College of Theology of the North Carolina College of Theology in 2015 with a Masters in Theology. Minister Matthews believes education is extremely important, but the knowledge and appropriate thorough understanding of the Bible is the only way to truly teach those seeking to follow Jesus Christ. 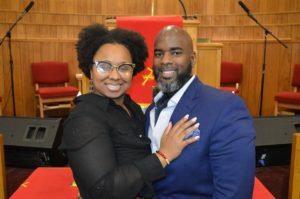 Currently, Minister Matthews is serving in the capacity of Associate Minister at Messiah Baptist in Bridgeport, Connecticut. His focus is building and supporting the spiritual development and maturity of the youth and young adults by using the same teachings that Jesus Christ used to educate and elevate his disciples. Terrance is currently working in Computer Forensics for the Department of Justice, where he is as encouraged and serious about the importance of Christ in the workplace. Minister Terrance F. Matthews and his lovely wife Daila Matthews were joined in holy matrimony on November 23, 2013. Lady Matthews is dedicated to the calling of ministry and fully committed to the service and leadership that is bestowed upon her husband. Minister Matthews has a vision that he will aide in the transformation of relationship between the church and the community.